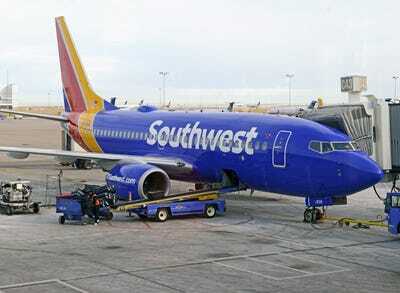 robert cicchetti/shutterstockA Southwest Airlines baggage handler was caught on camera throwing around luggage . A Southwest Airlines baggage handler was caught on camera recklessly throwing around luggage at the PhoenixSky Harbour Airport. Phoenix resident, Loudin Krueg, used his cell phone to film the Southwest Airlines employee throw luggage labelled “live tropical fish,” with multiple bags and boxes flying through the air. A Southwest Airlines baggage handler was caught on camera recklessly throwing around luggage at the Phoenix Sky Harbour Airport, according to multiple reports. KARE 11 NBC reports that a Phoenix resident, Loudin Krueg, used his cell phone to film the Southwest Airlines employee throw luggage labelled “live tropical fish,” with multiple bags and boxes flying through the air. “Luckily, we packed them in some pretty hefty stuff, but you get worried, when you have $US100,000 of stuff sitting under a plane and this guy’s throwing it 15 feet in the air,” Krueg said, according to Inc.com.